Grabbing the chance to be outside on a day that the weather wasn't too hot, too cold or raining, our playgroup met at the playground recently for a fun morning of climbing, digging in the sandbox and having a picnic lunch. Beautiful weather and our favorite friends? It was a great day. While pushing Little Sister B on a swing, I happened to catch a glimpse of two moms nearby chatting. There wasn't anything out of the ordinary about either one... until I looked down. One of them had an extremely cool pair of sandals, with all sorts of straps and buckles across her feet and ankles - making me think that they were reminiscent of a gladiator. Slightly too... much for my taste, seeing her hip footwear made me think that this spring one of the fashion must-haves is definitely cute flats and sandals. Which then immediately led to my next thought of THE site to shop for fun shoes while never having to worry about spending a fortune. For hot shoes at low prices, there's no reason not to head straight for ZooShoo. Over the past few months I've been able to introduce to you ZooShoo's Soda Song and Soda Video boots and their Soda Moby flats and now it's time for a new variety of adorable selections for the warm weather. After tallying up which shoes YOU all listed as your favorites from the most previous giveaway, it's time to have the opportunity to win them, isn't it? The Bamboo Scoot flats come in three different styles and a variety of fun colors, all of which can be dressed up or down to really complete your spring look. The round closed-toe, man-made suede and tiny .25" heel makes them both comfortable to wear as well as stylish to look at. I think the large buckle embellishment might be my favorite... although who doesn't love a little rhinestone or ruffles once in a while as well? Similar in style, yet with a pleated bow-tie design, I love the five colors of the Blkberry flats from Bamboo and just how comfortable these look to wear. A popular choice over at ZooShoo, you would definitely have to keep your eye on the sizes available to nab a pair of these, because for $14 these puppies are flying out the door in a hurry. I'm not sure what I would wear a pair of orange shoes with, but I think I could figure something out because I really love the style of the Willow sandals, also from Bamboo. How great is the striking yet simple look of them? While the mom at the park had far too many straps and buckles across her feet, I think that these have just the right amount of detailing and uniqueness that they are darn near perfect. Available in four colors, these are also a big seller over at ZooShoo... and with the combination of the fun look and the $13.50 tag, I can definitely see why. One lucky person will win their choice of Bamboo Scoot, Blkberry, Cruise or Willow shoes from ZooShoo! To enter to win: Visit ZooShoo and tell me which other of their fashionable shoes (other than the ones mentioned above) you would love to wear this spring and summer. 1 Extra Entry if you subscribe to the ZooShoo mailing list (found on the lower left of their homepage) to receive exclusive offers and coupon codes. 3 Extra Entries if you blog about this giveaway linking back to Thanks, Mail Carrier and ZooShoo. Please leave an address where it can be found. Giveaway will end on July 1st at 11:59pm CST. Do me the favor of leaving an email address or making absolutely sure it is visible in your profile, I have to have a way to contact the winner. The winner will be chosen by random.org and announced here as well as emailed and will have 48 hours to contact me or respond to notification or a new winner will be chosen. Giveaway open to U.S. residents only. 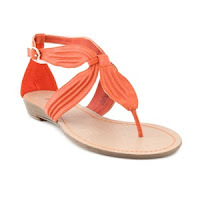 A big thank you to ZooShoo for providing a pair of Bamboo sandals or flats to one lucky giveaway winner. I was not given anything in exchange for this review except the opportunity to host a great giveaway. The opinions shared are my own and if you really need to see more, click here to see how I roll. I like the style of sandal called --Soda Raven. I like the sandal in the turquoise or the black colors. 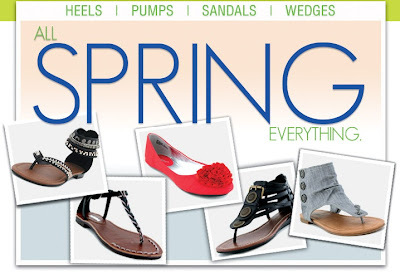 I love the Soda Raven sandal or Bamboo sandal! I'd like to wear the Tamora Sandals this summer. I love the Classified Armona Wedges in Black or Gray. I like the soda moby. Love the Bamboo Mystery in gold!! I love the Classified Almost (in black) wedges! Too cute! I like the Soda Lantana (Blue) which would work so well for summer. Its not so dressy but could be worn from casual to work. I like the Soda Gabby (Grey) sandals! Became FB fan of ZooShoo! i love the Classified Armona in black. I love the soda in Gabby! I entered the little peas giveaway! Entered the Lime Ricki Swimwear giveaway. I'd wear the Soda Tamora sandals. I like the Steve Madden Dazler (Silver) wedges!